Fracture is not a break. It is a continuation and a cycle, of tradition, which itself is ongoing and ever evolving. Drawing from India’s rich handloom and textile tradition, the Devi Art Foundation spearheaded by Lekha and Anupam Poddar, alongwith three co-curators – textile curator Mayank Mansingh Kaul, designer Sanjay Garg and textile author and Padma Shri awardee Rahul Jain – conceptualised FRACTURE, an exhibition aimed at exploring textile as art, as production and asking where it will go from here. Presenting specially commissioned works of a variety of designers, visual artists and a filmmaker (chosen after an initial call for proposals and representing a project undertaken by the Poddars from 2000-14), the exhibition showcases these more than 30 works created in collaboration with master craftspersons and artisans. 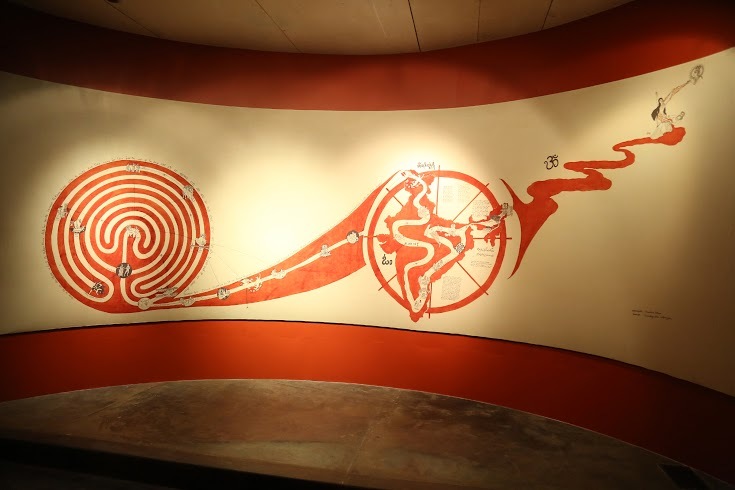 From Bernice Ellena’s ‘Yatra’ that plays on the kalamkari narratives and Draupadi’s endless saree (of Mahabharata), to Chandrashekhar Beda’s ‘Flying Rug’ crafted on a specially designed loom with a curvilinear weft, this exhibition is a spectacular rendering of urbane, contemporary idioms created using traditional techniques. 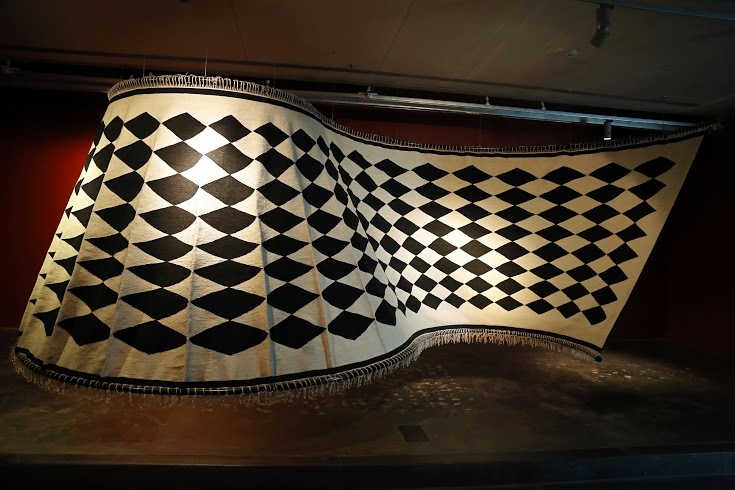 This is also a showcase of the process of creation, in terms of the dialogue between the partners – artist-designer-artisan – who have come together to represent a unique language through which textiles are approached at the stage of creation and the form in which they are presented. In Bernice’s work, for instance, Niranjan, the Kalamkari painter she worked with, uses natural dyes to render the images on cloth. The practice of washing of the vegetable colors in the holy river (Swarna-Mukhi) by artisans, becomes a part of the journey (Yatra) she is undertaking. Beda’s ‘Flying Rug’ goes much beyond its nomenclature when it is mounted and presented so as to appear to be floating, standing a few inches above ground. Other showcased works include Manish Arora’s Untitled kaleidoscopic pattern in woven silk and metal thread, indentifying with his repertoire of work as “image-maker”. Swati Kalsi presents a stunning sujani embroidered cotton and metal thread on silk in the form of a shell, playing on the feminine expressions of birth, nurturing and protection. Graphic Designer Ishant Khosla takes readily recognisable logos of well known western brands and creates repetitive patterns for turbans, which are displayed in open flowing form. 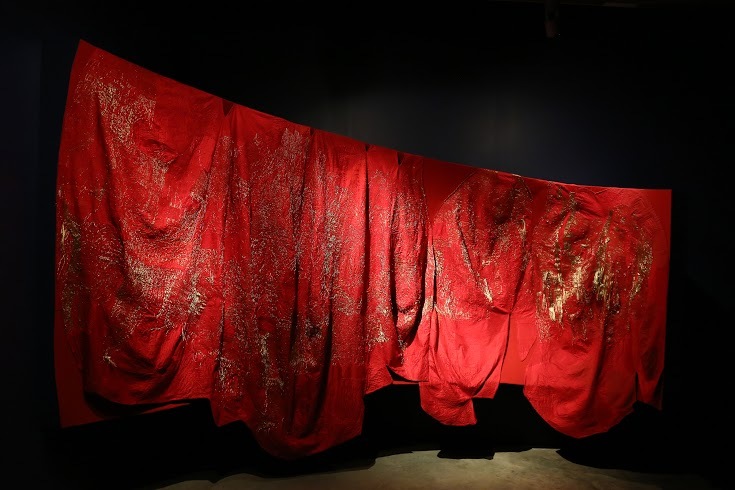 Rimzim Dadu’s Silicon Jamdani saree plays on this traditional textile’s translucent form, working with silicon rubber sheets shredded to form thin yarn. Walking through the corridors of the exhibition, the fascinating labor of design and development comes alive, alongside the references to its makers, collaborators, dialogues among curators and its place of creation. Each exhibit has been conceptualized to present an idea of handmade textiles in an evolved avatar, representing a moment in time through its journey to becoming something new. Posted in Art, Artist, Crafts, Delhi, Events, Textiles, Weaving and tagged Delhi, Design, Designer, Devi Art Foundation, events, evolution, Exhibition, Handmade, Heritage, idiom, Language, Textiles, Weaving. Bookmark the permalink.